I took these photos at Anthropologie with my iPhone while at the mall a few weeks ago. I'd forgotten that I had taken them until I was updating my phone and they ended up on my computer. Thought I would post them before Christmas comes and goes. 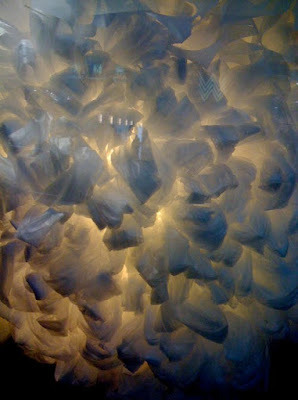 Anthropologie is famous for their grand displays which have led to lots of inspiration for those of us who shop there. 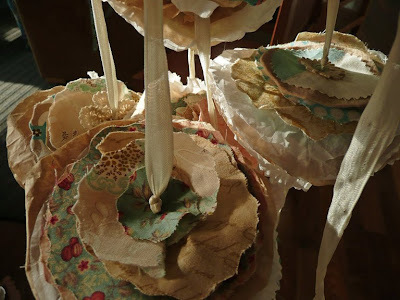 For instance, Pam always says her coffee filter garland (shown below) got it's roots from an Anthropologie display she recalls seeing and tried to recreate herself. Believe it or not, those giant snowballs shown in the first photo are actually made out of folded, clear trash bags and lit from behind. Isn't that amazing? You would never know that unless you get up close and study the display. 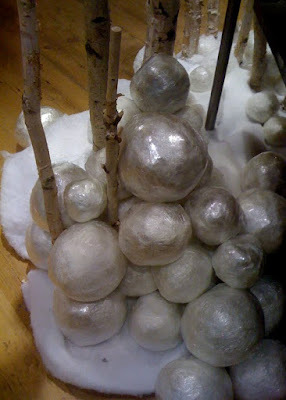 Another display that I thought was neat was this woodland wonderland make from tree branches with stacks of frosty snowballs at their base. It looks like children have been stocking up their ammunition for an upcoming snowball fight, doesn't it? The snowball's glistening appearance comes from what appears to be simple plastic wrap wound tightly, in many layers, over styrafoam balls. The build up of all those layers is what really makes them look so good. Actually they look like ice balls - so look out! 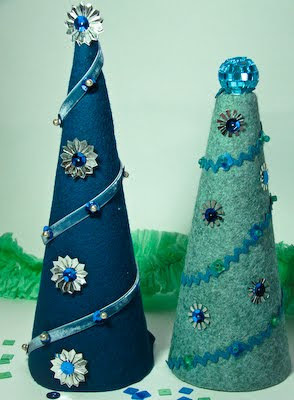 Melissa has a wonderful tutorial on Joli Paquet today in which she shows us how to make Felt Cone Christmas Trees. And I hope you didn't miss Cerri's beautiful Vintage Wall Hanging posted on Wednesday. Well, it's time to get ready for the cookie exchange party I'm going to tonight. Enjoy your evening! wow. 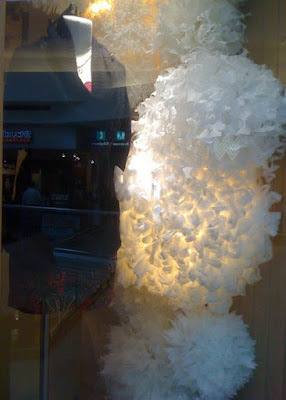 thank you for sharing the pics from anthropologie. there isn't a shop very close to me so i mostly visit their online shop. i think i need to take a little drive soon though and see some of their cool displays! 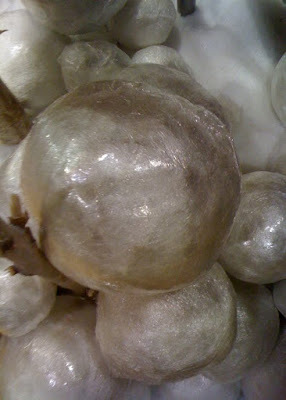 This post is filled with so many inspiring ideas... maybe I'll try my hand at the "ice" balls and garland! Love the wonderful ideas you have shared with us. I think I could actually do a couple of these. those snowballs are so cute!!! what a beat idea!!! isn't it amazing what we can do with our recylables and a bit of inspiration, the bag balls are stunning, I'd never have guessed. I never see anthropologie in the "flesh" living in Arkansas but I love love the catalogs. I use them in my projects all the time! You have created a wonderful blog, I'm glad to have stumbled upon it, quite the muse!